The Blood Sea of Istar... grim reminder of the vengeance of the gods. Roiling and churning angrily, these sanguine waters are the grave of many a brave sailor. Across this haunted sea the heroes must journey to find freedom and victory. 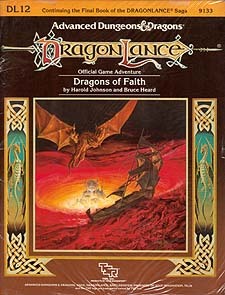 Dragons of Faith is the twelfth in the series of DragonLance adventures for use with the AD&D game system. Included are optional Battlesystem miniatures rules. You can play this adventure by itself or as part of the grand quest that spans the entire DragonLance saga. An adventure for character levels 9-10.